We have witnessed various new procedures for hair in the recent past, and this has opened up new horizons for having lovely mane for us. This was not possible until few years back, but now no matter what your hair issue is, there is for sure some procedure that can be apt for you. One such treatment into which we are focusing today is the cellophane hair treatment. Cellophane hair treatment is basically a chemical process which helps in endowing shine as well as softness to the hair. This treatment will help in restoring the beauty of the hair which was lost due to various reasons. In this process the hair cuticles are sealed with the help of cellophane which helps in protecting it from turning dry. Who should go for Cellophane treatment? Cellophane treatment is best for those who are often into hair treatments like curling straightening, using hair color, hair products etc. generally end up with dry and damaged hair. The cellophane treatment will get back the lost shine and smoothness to such kind abused hair. Also Read – Mesotherapy for Hair Growth – What You Need to Know About It? People who expose their hair in the salt water or treated water while swimming, surfing etc. can get benefited from cellophane hair treatment. The exposure to salt water makes the hair dry and brittle and the cellophane treatment brings back the shine and adds life to the hair. For people who expose their hair to dust, pollution most of the time can go for this treatment. This makes the hair damaged and dry. The cellophane treatment is a good choice in order to make the hair shiny, smooth and manageable yet again. If you need different hair color, that can also be done with this treatment as there are several hair colors available for this hair treatment. The coating of cellophane helps to shield the strands of the hair from impurities as well as dirt from the environment. Cellophane hair treatment endows life and beauty to the hair and makes it smooth as well as easy to manage. Procedure: During the cellophane hair treatment, each strand of hair is coated with the polymers that provide a shield to the hair cuticles. Cellophane hair treatment is a simple procedure and can be done at the comfort of your home. First and foremost, you need to wash your hair well with the help of a shampoo. After that apply cellophane on the wet hair and leave it on for half an hour. To further stimulate the absorption of the cellophane, wrap it up with a saran wrap. Rinse it off after an hour and follow it with a conditioner. Dry your hair. 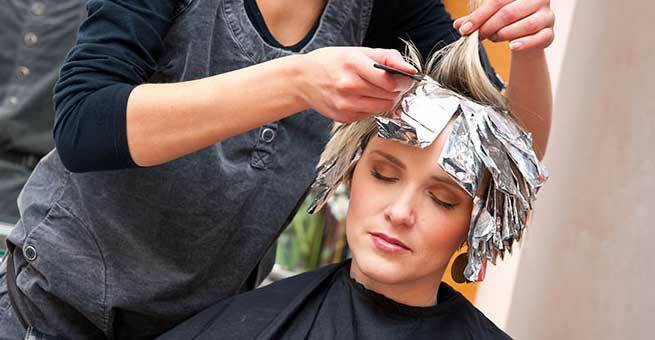 The cellophane hair treatment is also a semi-permanent coloring service. During this procedure no pigments are used for coloring of the hair. This treatment basically done with the help of the glossing agents. Cellophane hair treatment endows color as well as shine to your hair. It will fill at the same time plump the hair shafts in the process and thus perfect the layer of the hair cuticle. The one side effect of the cellophane color treatment is that, this treatment of coloring is a temporary one. The color may wash away when you shampoo your hair for 8 to 12 times.